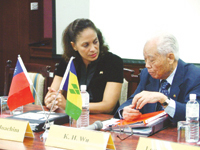 The 23-year-old diplomatic relationship between St. Vincent and the Grenadines and Taiwan is being steered in a decidedly new direction with emphasis now on the economy. In this regard, an investment mission was arranged to engage with the public and private sectors of Taiwan. This mission was headed by the Executive Director of the National Investment Promotions Inc., Suzanne Joachim who presented the new initiative to the Taiwanese business community in a forum on August 30 at the Howard Plaza Hotel in Taiwan. Two aspects of the possible new economic engagement were presented. First, members of the International Financial Services demonstrated that establishing offshore structures using St. Vincent and the Grenadines Financial Services was more competitive than using the British Virgin Islands or the Pacific Islands that Taiwan corporations now use. Second, the strategic position of St. Vincent and the Grenadines in the Caribbean, making it capable of being used as a launch pad for Taiwanese goods, was presented as a reason for Taiwanese small manufacturing to use the island to assemble products targeted at the Central American and Latin American markets. To this end, commitment was sought from the Taiwan business community to bring some aspects of their light manufacturing to St. Vincent and the Grenadines, which would enable them to make use of the concessions available here. At least one business on the mission was able to do a deal worth US$500,000 with a Taiwanese firm.